“This is a story of how a modern day Knight created the perfect ring for his Princess. It’s a good one,” was Jince’s response. Jince and Anh Linh began as high school friends – just friends, but two peas in a pod. Both were top of their graduating class and study buddies. Their friendship continued to blossom throughout college, bad relationships, and post graduate school life. Once settled in to their hectic 9-5 work lives, they began to realize that all of their free time was spent with each other. One night outside of work, Jince was talking to Anh Linh and let the big “I love you” slip out in conversation! The very next day Ahn let that same special phrase slip out too. They both knew that that was it. The life long friendship and love they had been searching for was with them the whole time. When the time came for Jince to start looking for a ring, he already knew exactly where to go. 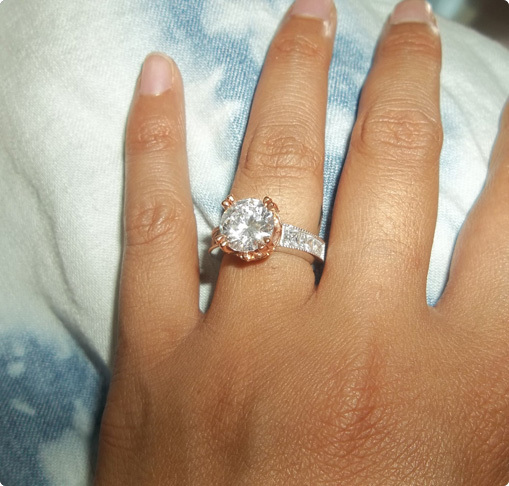 He had previously worked with Diamond Nexus to purchase Anh Linh a promise ring. 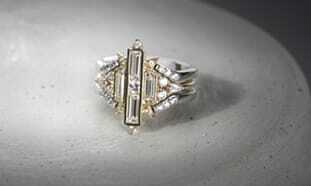 He was drawn to lab created diamonds due because of his background in chemical engineering. He knew lab diamonds were identical to mined diamonds. "With its combination of metals this fantasy inspired crown was designed to make her feel like a princess!" Without a doubt, this ring needed to be special and one of a kind, so he chose Forever Artisans to create the ring for them. 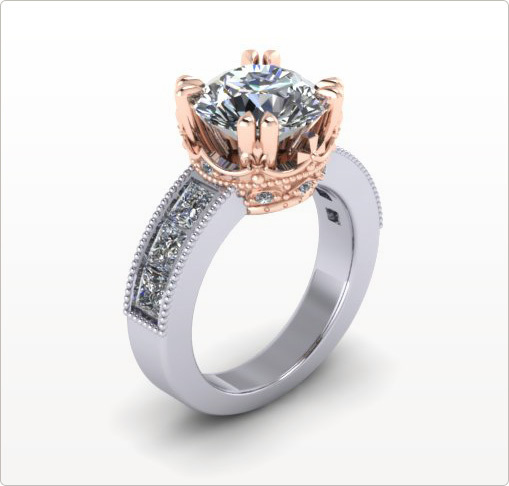 Reflecting the fairytale of their romance, Jince knew this ring needed to be princess themed. He envisioned a crown sitting on a band with a large diamond in the center. He designed this ring with a “bigger is better” mindset. Alterations made along the way included: Stone size, making the crown stick out a bit, using rose gold and adding stones to the crown. It took seven total alterations and one year to design, but every fine-tuned detail came together and Jince created the perfect ring for Anh Linh. Jince knew that this stunning, symbolic ring required a proposal of similar fashion. With her boss in on the plan, Jince called Anh Linh’s work saying he felt very sick and she needed to come home right away. When she arrived home, she discovered music playing, and Jince dressed in his best and down on one knee. The surprise doesn’t end there! Her bags were packed and there were tickets to Cancun! 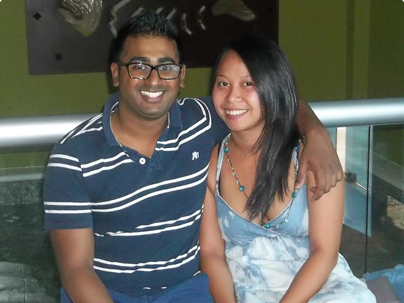 Happily engaged, the two whisked off to a Caribbean vacation. A fairy tale, indeed. How big is the center stone? It looks much bigger on her hand than in the picture of the ring alone. Wow! It looks so beautiful on your hand dear.